Sometimes weight loss is more about how much you eat rather than what you are eating. According to the Centers for Disease Control and Prevention, the average restaurant meal is four times larger now than it was in the 1950s. Follow these tips to gain control of your portions at home and when dining out. The best way to know exactly how much you are eating is to measure it. 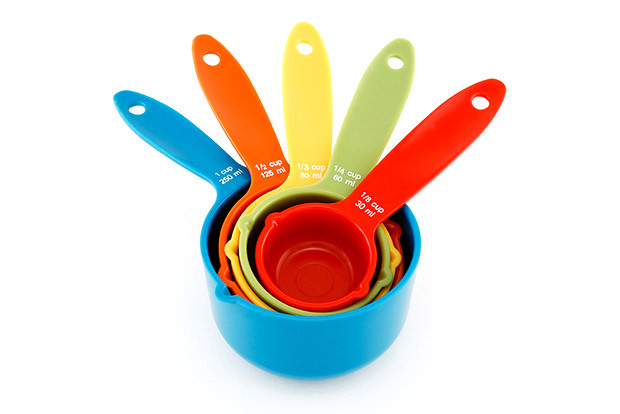 Buy a food scale and multiple measuring cups and measuring spoons. Store your measuring tools right next to your foods for easy access. Put a ½ cup next to the oatmeal, a tablespoon next to the peanut butter, and the scale near the refrigerator to weigh meats and cheeses. Don’t allow yourself free reign with a box of whole grain crackers, or a bag of nuts and dried fruit. As soon as you return from shopping, measure single servings of your snacks and put them in sealable containers. This will reduce the urge to munch mindlessly, and makes it easy to grab a healthy snack when you are rushing out the door. Eating slowly allows your body to tell you when it’s full. Put your fork down between bites. Focus on enjoying the company you are with or the entertainment in the room. Making a conscious effort to slow your eating will make you more aware of how much food you are consuming. Voice your request for half portions or tastings even if it’s not on the menu. When you find restaurants that cater to better portion control, spread the word. Use social media to show your appreciation. The more customer support there is for these changes, the more likely the restaurant will keep them around. Take half home, but take it a step further. When smaller portions aren’t an option, box up half your meal and take it home. When you return to your kitchen, measure it. Put meat on a scale, and transfer pasta to a measuring cup. This provides an educational lesson so that you begin to understand just how much food restaurants are serving. You will likely find that some half orders are still larger than a healthy portion for one person.